There are two approaches to substituting bear bile. The first uses synthetic ursodeoxycholic acid (UDCA), and the second substitutes bear bile with herbal medicines. Although bears are the only mammals to produce large amounts of ursodeoxycholic acid, or UDCA, this, the principal active component of bear bile, can be created synthetically or semi-synthetically in the laboratory without harm to any animal species. "Synthetic bear bile, or ursodeoxycholic acid (UDCA), with the generic drug name of ursodiol, is now being widely produced under brand names such as Actigall, Urso, Ursofalk, Ursogal and Ursotan, depending upon where you are in the world. It can be synthesised using cow or pig bile and even using no animal ingredients. "According to Professor Clifford J. Steer M.D., Professor of Medicine, University of Minnesota Medical School, it is now possible to analyse in detail the constituents of bear bile and reproduce the extract by purchasing the different bile acids from commercial vendors, and indeed to synthesise the different bile acids in the laboratory without using any animal tissue at all and at a fraction of the price of farmed bear bile. His interest has arisen from his groundbreaking research into the application of synthetic UDCA in the treatment of Huntington’s disease. "Data accumulated to date point to UDCA’s usefulness in treating numerous diseases, especially intrahepatic cholestases. The drug is demonstrably safe, even in trials involving children. We know that used in the treatment of biliary atresia subsequent to a Kasai procedure it improves biochemical parameters such as bilirubin levels and hepatic enzyme activity, as well as promoting an increase in body weight. Good effects have been obtained in the treatment of cholestasis presenting in conjunction with Caroli’s disease, primary biliary cirrhosis, dissolving gallstones and foetal erythroblastosis. Based on research results published in July 2004, derivatives of synthetic UDCA may serve as potential lead compounds in the treatment of colon cancer. Research into its use in the treatment of Parkinson’s disease, Alzheimer’s disease, spinal cord injuries and hemorrhagic strokes is ongoing." "We definitely do not have to use bear bile as it can be replaced by herbs." Many people believe that bear bile cannot be replaced by herbal alternatives because of a lack of supporting research. However, thanks to a grant from the Pong Ding Yuen Endowment Fund, matched by Hong Kong Government funding, Professor Feng Yibin at the University of the Hong Kong School of Chinese Medicine began researching the effectiveness of various Chinese herbal alternatives for ailments commonly treated using bear bile products early in 2008. His preliminary findings were presented at the 5th Pong Ding Yueng International Traditional Chinese Medicine Symposium, held on 13 December 2008. He described studies comparing extracts from two species of the herb coptis (Huang Lian - Coptidis Rhizoma), against raw bear bile and purified active ingredients from bear bile. 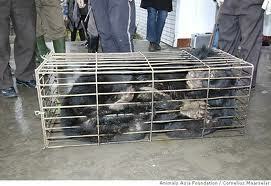 The tests showed coptis to be far more effective than bear bile at killing cancer cell lines. The World Society for the Protection of Animals has published a report on a wide range of herbal alternatives to bear bile.